A security researcher today publicly disclosed details and proof-of-concept exploits for two 'unpatched' zero-day vulnerabilities in Microsoft's web browsers after the company allegedly failed to respond to his responsible private disclosure. 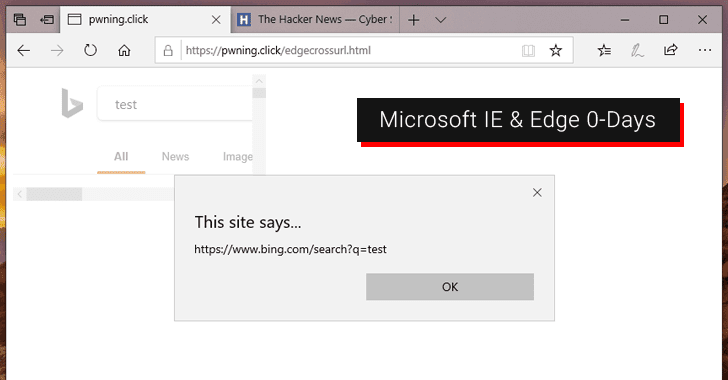 Both unpatched vulnerabilities—one of which affects the latest version on Microsoft Internet Explorer and another affects the latest Edge Browser—allow a remote attacker to bypass same-origin policy on victim's web browser. However, the vulnerabilities discovered by security researcher James Lee, who shared the details with The Hacker News, could allow a malicious website to perform universal cross-site scripting (UXSS) attacks against any domain visited using the vulnerable Microsoft's web browsers.